Perfect for slipping into pencil cases and backpacks alike, the White Recycled Plastic Ruler is hardwearing and strong. It is the ideal tool for both professionals and students, offering an effective tool for measuring and drawing. 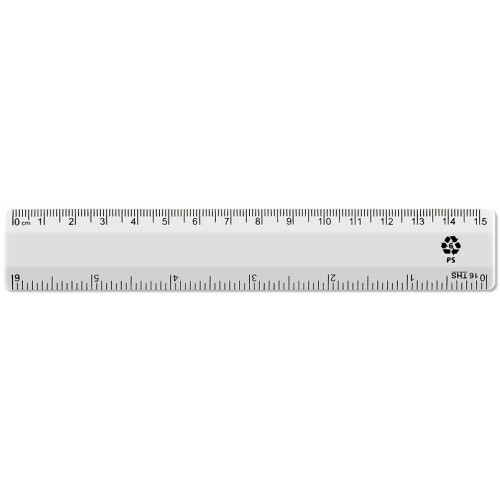 The ruler has been manufactured from a lightweight and hardwearing plastic. This offers a slight flex to minimise the risk of snapping and a wipe-clean surface to extend the lifespan of the tool. It comes in a shorter 15cm length which still allows the user to perform basic tasks and fit it in most standard pencil bags or containers. The plastic used is 100% recycled to keep its production more eco-friendly and allowing it to be recycled once more at the end of its life. When it comes to measuring, the smooth surface is printed with contrasting black ink, forming clear line and numerical measurement indicators. Line the side up between two marks and you'll be able to take a clear and entirely accurate measurement of the distance in-between. It can be used to measure in both inches and centimetres with entirely smooth sides and slightly rounded corners. From infancy through to adulthood, this ruler will support your requirements with ease. We provide a bulk orders option to reduce the price per ruler. This brings the cost down to £0.22 for orders over 10 and to £0.16 for orders over 100. Here at The Ruler Company, our aim is always to provide you with the best prices, the strongest construction and the longest lasting designs.